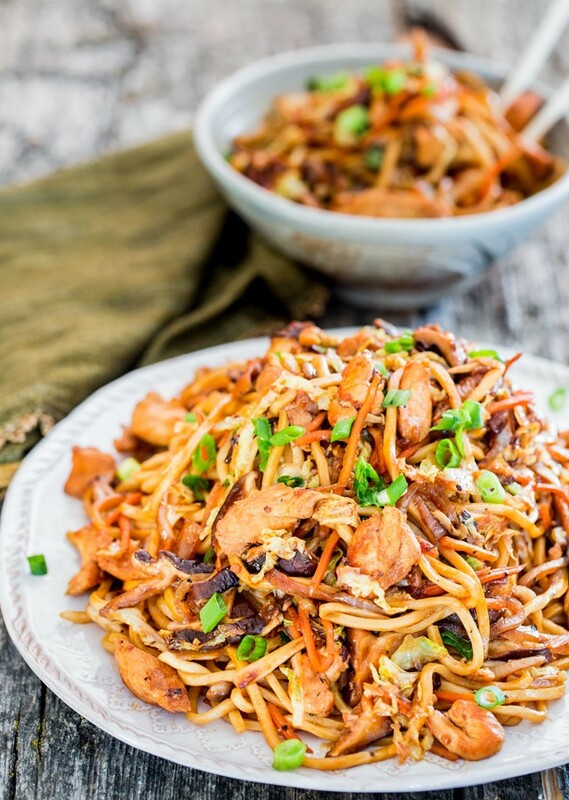 Chicken Lo Mein - get stir-frying with the easiest and most scrumptious chicken lo mein recipe. Forget take-out, whip this up at home! Dovetailing Tip: Use leftover chicken from Meal 1. Add all the sauce ingredients with the veggies and stir fry for 1-2 minutes. Add chicken last, along with the noodles, and stir fry 1-2 minutes more. Cook the noodles according to package instructions. Drain and set aside. In a small bowl whisk all the sauce ingredients together, then set aside. In another medium sized bowl toss together the chicken with the soy sauce, ginger and garlic. Heat the olive oil well in a large wok. Your wok should be nice and hot before adding the chicken to it. Add the seasoned chicken and cook for about 5 minutes or until the chicken starts to brown and is no longer pink inside. Transfer chicken to a plate and set aside. Add the other 2 tbsp of olive oil to the wok then add the shiitake mushrooms, cabbage, carrots and onion to the wok. Cook for a minute while tossing around. Add the chicken back to the wok. Add the cooked noodles, prepared sauce and toss everything together. Turn off the heat.